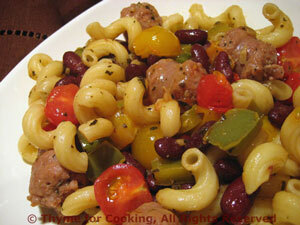 Pasta with Sausage, Cherry Tomatoes, Red Beans, Thyme for Cooking pasta. An easy pasta dinner, updated for spring with cherry tomatoes. Heat oil in large nonstick skillet over medium heat. Add sausage and sauté until sausage is browned, 5 - 7 minutes. Add beans, chicken stock, herbs and heat through. When pasta is done, drain and add to skillet along with cherry tomatoes. Cover and simmer 1 - 2 minutes to heat through and cook tomatoes slightly. Serve.